Releasing from Anchor Bay today is this little horror film, that I’m sorry to say, is probably best left unseen. Part advertisement for an actual place, the Hotel of Horror, check it out here, and part, what feels like some poorly written and edited Fox television show from the 90s, 6 Degrees of Hell is a convoluted mess which skimps on any real thrills, chills, spills or gore, but wants you to think it has them anyway. 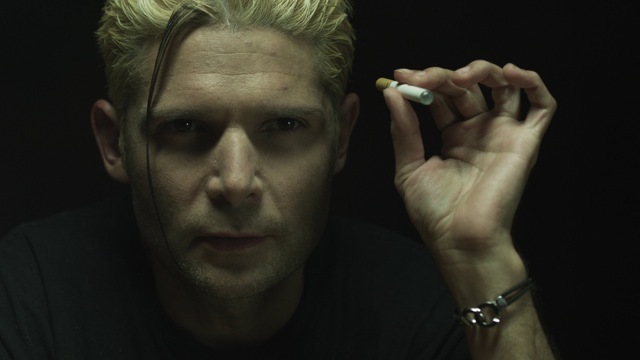 For some reason, Corey Feldman is in this movie, for all of about 10 minutes in total, but that was apparently enough to warrant giving him above title billing. He’s there to serve to tie the narrative together, but that proves tough to do. In the plainest of terms, the film follows a paranormal ghost-hunting show, Dead TV, hosted by Erik (Kyle Patrick Brennan) who have been called to the town where this Hotel of Horror is, Pennsylvania, to investigate some strange goings on as well as a death or two. They encounter an Entity (you can tell because it has completely black eyes) who knows Erik’s history, murdered his sister, and is close to being able to walk the earth unfettered by the chains of hell. The key to its plan is young psychic, June (Nicole Cinaglia), who spends a lot of time screaming, and running in the final half of the movie, when all you really want her to do is stand up to this thing, and square off against it. There are a lot of ancillary characters who get knocked off on the way, each one a missed opportunity to at least employ some practical effects and gore, but even that is denied the viewer. There really isn’t much to this film to actually warrant the 18A rating its been slapped with but for the occasional language, the smoking of e-cigarettes, and the potential for (not very) frightening images. I think a documentary about the Hotel of Horror would have been more entertaining (and many of the site’s attractions show up in the last half of the film), as it at least sounds interesting. This film, however, is a bit of a mess, and nothing in it was done right. Now that’s easy for me, having never directed my own film, but I do know pacing, editing, story, and moments of horror from the hours and hours I’ve watched it when I covered the 101 Horror Movies to See Before You Die, so I think I can ascertain what works, and what doesn’t. It’s a mess. It needed a stronger, tighter story, a clearer vision from the director, and if you are going to expense out for a Name, like Feldman, use him. Still, I’ve been wrong before, and I’ll be wrong again. You can have a look for yourself, 6 Degrees of Hell is available today from Anchor Bay!